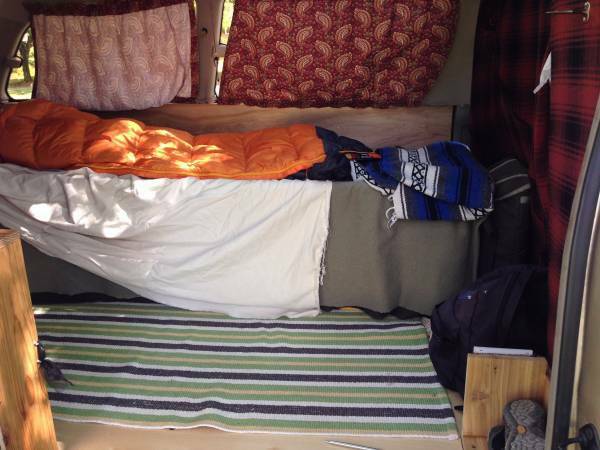 The seller just returned from a cross country trek and would like to find it a new home. It has been driven 10,000 miles in the two months of ownership and have maintained to car to a very high level. 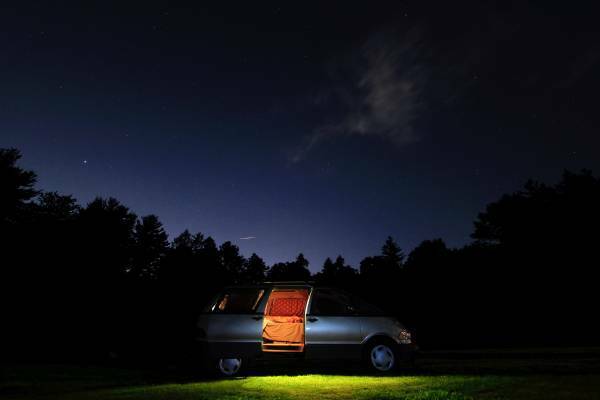 The van is equipped with a super charged engine that is good for 158 horsepower and has 177,000 total miles on it. - Cedar (i think, I can't recall now) shelf, and rear storage space (i put a cooler in there, you can have the cooler too if you want it). - The actual wood work is sort of unfinished as there are gaps around the sides (aka no wooden molding), i just hit the road before finishing the build of the van. You can obviously change whatever you want. - A cot is held down with little divets in the flooring, and a heavyweight curtain separates the rear and the front. 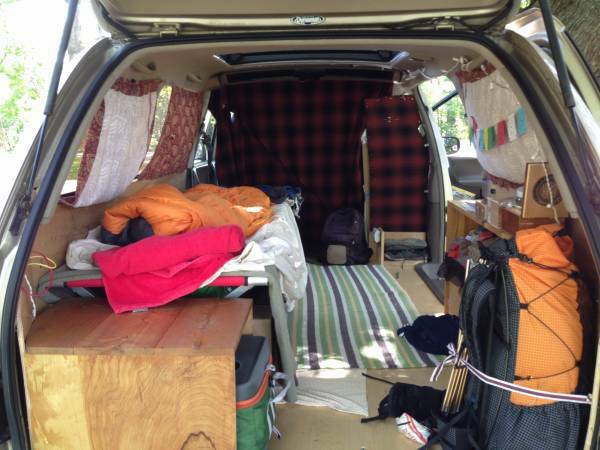 This is because I wanted to run a bed longways (most folks set it up in the trunk space). I have cardboard boxes for storage under the cot. They were free. Once again, you can put some time into it, or just use it as is. - Wall behind passenger seat with coat hook, also a shoe space and a carbon monoxide detector. I have a fire extinguisher as well. - DC LED lights in the rear too. Only wired to work when the door is open. - drilled some cigar boxes into the self for storing little things. -Did notice my carbon monoxide detector go off on the ride. Stopped at an exhaust shop, the said the system was super clean and had no leaks. Their thought was the engine hatch (Previa engine is under the driver's seat) might not be propperly sealing when closed. This is something to look into if you buy this car. The only cons brought up are some small amount of rust on the trunk lid, rock chips on the windshield, and the car has no working radio. Cory still has not gotten around to putting the interior back together in the 1995 Mercedes C36. Let me understand this ... they pulled the seats out, laid unfinished plywood in the back, pinned up some ugly fabric over the windows, and piled the interior with their crap - and they call it a camper. I assume the 10,000 miles was logged following Phish around the country. I guess anything can be a camper. Would it be that hard to clean out the thing before you try to sell it? Wait, cleaning it out would expose that it's nothing more than a van without seats. 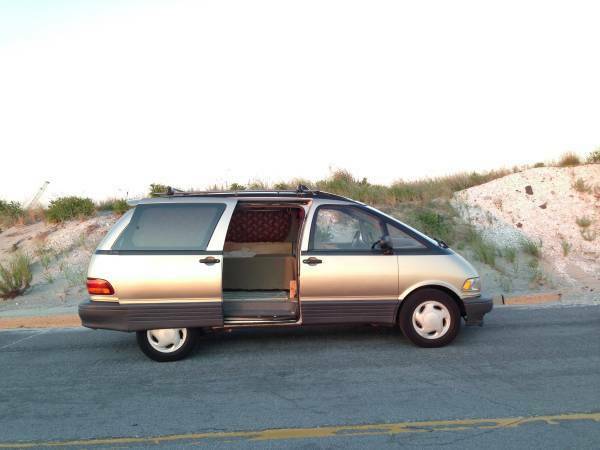 It's a used 177k mile van that is worth less than the same van with a complete interior (which is worth about $600). Oh, and there may be a carbon monoxide leak inside. Enjoy your trip. :( I own this van now. Its a real charmer. Super clean and well executed. In great mechanical shape. The owner was monastic illustrator and a truly brilliant light. Hope you figure out what has you so bothered. for 22 years ago who else offered anyting like this mini cross-country snow demon?